‘No Smoking‘ said the sign that hung from the workshop roof. Made sense, what with all the wood-chip, dust and sparks. Dad though loved his Red Luckys. On the hour, every hour he’d be found outside the shop inhaling deeply, while watching the catfish ripples on the lake. Kesanek Mill is now gone, as have most of the craftsmen who worked the softwood. Irony is it wasn’t a fire that killed any of them. Just as it ain’t a fire that is going to do for my old man. These days dad still likes to smoke and watch the ripples, as the coughs from his dust filled lungs echo across the lake. This entry was posted in Fantasy World, Friday Fictioneers, Story Time and tagged 100 Words, Challenge, Creative, Fantasy World, Fiction, Flash Fiction, Friday Fictioneers, Novels, Short Stories, WordPress on January 29, 2014 by paulmclem. Willing those eyes to notice mine. Today the table lies empty. These 33 words form my entry into the Trifextra 101 challenge. The story was in response to the above photo prompt (picture courtesy of Thomas Leuthard/Foto.com). I hope you enjoy what I came up with. This entry was posted in Fantasy World, Story Time, Trifextra and tagged 33 Words, Challenge, Creative, Fantasy World, Fiction, Flash Fiction, Novels, Short Stories, Trifecta, Trifextra, WordPress on January 27, 2014 by paulmclem. Nightshoes had farmed the rocky strip of soil above Thorndale Manor since before anyone could remember. Best beans in the county were grown up there – ‘Young’ Joe Nightshoe was famous for his runners. Last summer a couple of ‘townies‘, as Joe calls them, bought the manor. Fancy dreams of becoming self sufficient and all that – Joe wasn’t convinced, but he didn’t say nothing. With winter slowly melting into spring, the manor’s windows are again boarded shut; out front a nearly new tractor is carefully being backed onto a waiting flatbed. Up on his strip Joe checks his beans – it was already looking like his best crop yet. This entry was posted in Fantasy World, Friday Fictioneers, Story Time and tagged 100 Words, Challenge, Creative, Fantasy World, Fiction, Flash Fiction, Friday Fictioneers, Novels, Short Stories, WordPress on January 22, 2014 by paulmclem. ‘Ahead and to the left’ came the whispered, nicotine inflected instruction. Turning, I could now see it: in between the rocks shone a small fissure of light – a glimmer of flaming yellow and orange. ‘Got it. I’m moving in,’ I replied, guiding the eye carefully into position. As I moved in tighter the light grew stronger; it’s lure warm and inviting – the coldness of our own distant sun’s embrace briefly forgotten. Soon the thin flash of light filled the screen. It was no longer a narrow gap in between rocks: it was a window. From within, the source of the flame was clear as a roaring fire licked through an open grate – a black kettle steaming furiously, yet seemingly unwatched, from inside. ‘Can you see this control? ‘ I stuttered. ‘We see it. Get in as close as you can,’ demanded the previously calm, monotone drawl. As the extended eye roved the room, silence gradually fell over my headset. The scene was one straight from the pages of Dickens: the wrinkled, red Chesterfield armchair by the fireside; the quaint collection of porcelain figures arrayed on the mantelpiece. On the wall pictures, maps and portraits of people and places – too faded to see details, despite the eye being on maximum zoom. For the briefest of moments two tiny flickers of light emerged from the darkest, farthest corner. Then again. The eyes betraying a fear – a fear that their life was about to change forever. As I remained, almost frozen, a hand slowly emerged – long, pale fingers gripping the arm of the empty fireside chair. As slowly as they had appeared, the fingers once more retreated, fearfully into the anonymity of the dark. My heart suddenly sank, guilt replacing the explorer’s inquisitiveness of moments before. Soon radio communications once more crackled through the gravityless atmosphere of the red planet. It was me who was first to speak – to state what they already undoubtedly knew. These words, based on the third definition of the word ‘quaint‘ , form my entry into the Trifecta 110 writing challenge. This piece was placed second by the esteemed editors of the Trifecta Writing Challenge. As ever I am flattered that those judging saw something in my work. Much appreciated! This entry was posted in Bits and Pieces, Fantasy World, Trifecta and tagged 333 Words, Challenge, Creative, Fantasy World, Fiction, Flash Fiction, Novels, Short Stories, Trifecta, Trifextra, WordPress on January 20, 2014 by paulmclem. The churchyard was alive with nervous chatter. Musical instruments were tuned and tables set as the villagers prepared. A freshly caught young boar roasted slowly over a flaming pit; barrels of vintage ale hastily unplugged in thirsty anticipation. However, until their old friends arrived the festivities couldn’t begin. This is the way it had to be. As the stars inched towards their foretold position the first shadows formed. From the darkness into the light of the blazing fires they slowly came. Old familiar faces; voices not heard for a generation. Welcoming embraces only dared to be offered by the most senior of the villagers. The rest remained at a respectful distance until the formalities were complete. Only then could the party truly commence. Until first light it continued. Stories exchanged, age old songs sung lustily as laughter and kinship echoed across the neighbouring fields – the churchyard had never seen such a gathering; had never seen such joy. As always though they wouldn’t be able to stay. Come the dawn the churchyard once more fell silent. Sadness returning as old friends retreated regretfully back into the shadows; back into the glass – to stand, watching over us until the distant stars once more aligned. This entry was posted in Fantasy World, Other Challenges, Story Time and tagged 200 Words, Alastair, Challenge, Creative, Fantasy World, Fiction, Flash Fiction, Novels, Short Stories, WordPress on January 19, 2014 by paulmclem. As a watery dawn sun began to fill the heavens, church bells peeled triumphantly from both east and west. Betwixt the celebrating factions the Cassitara rippled and bubbled innocently on her way; nearby treetops once more echoing with the sound of bird song. On the shallow river’s mud strewn banks, confused, panicked footprints abound; empty, spent cartridges and discarded rifles glistened with drops of blood speckled dew. In mid-stream a watchful lone hawk pecked lustily at the weeping, shattered eye socket of a young soldier. Next year they would all be back. Once more to fight for the right to control the Crossing. This entry was posted in Fantasy World, Friday Fictioneers, Story Time and tagged 100 Words, Challenge, Creative, Fantasy World, Fiction, Flash Fiction, Friday Fictioneers, Novels, Short Stories, WordPress on January 15, 2014 by paulmclem. The Charter were on the move again: drifters on one lifelong trip some called them. Whether the ties that bound were injected straight into the blood, or washed in slowly through endless sessions of soporific doctrine the result was the same: join and your mind became theirs. The group’s leader, ‘The Great Helix’, used to push life insurance back east. These days he sells his malleable young followers on the promise of a true afterlife, ‘the only real salvation’ as he calls it. There aren’t any coloured robes, no mystical chanting, no outward signs of religious or spiritual zealousness – no free love. Just plain ordinary, means you never really see them coming. By then it can be too late. Charlie had been with the Charter for the best part of his adult life. Like a lot of the flock he’d been a troubled kid; like all of the flock he’d learned to forget. Once within the all consuming grip of the Charter you didn’t have a previous life – you’d only had the path which led you to where you now stood. Families, crimes, pains – all forgotten, all left behind. From there on in your goals were shared, your problems borne by others. Charlie had quickly established himself as one of the Charter’s best recruiters – a combination of his boyish, if somewhat faded good looks, and a refusal to be discouraged by even the most disinterested of prospects made him one of the Helix’s favoured children. This morning the cobbled central streets of Valeranna were busy with late winter shoppers. Just the faintest hint of frost tinged the air as the Charter pulled off the 78 and into town. As ever, the great one was not to be seen. Instead it was Charlie who once more reaffirmed to his fellow believers the value of persistence. Despite Charlie’s best efforts, numbers had been falling in recent years – Valeranna though had been fertile hunting ground for the Charter in the past: Charlie himself began his own path to salvation from this small, coastal commuter town. For years his heartbroken mother tried desperately to get in touch, to bring him home. However, Charlie like all true members of the Charter turned his back. He only had one family now. His return to Valeranna was proving a tough pitch. While others flagged and angled to pack up for the day, Charlie remained hopeful. It was then he saw her: she looked like someone seeking an answer. ‘Excuse me lady, can I interest you in the true path to Salvation?’ he began. The woman turned to face her assailant. Black, tightly bunched hair flecked with grey; the shadows under her eyes hinting at an unsought excess of cares and worry. She didn’t look an old woman by any means. However, she looked tired; she looked like she needed salvation. As Charlie readied himself to rescue another lost soul he paused – an unwelcome, slightly queasy feeling of vague familiarity momentarily flustering his normally equable delivery of Charter rhetoric. ‘Chucky? Chucky, is that you?’ asked the woman. ‘My name is Charles, and I implore you to seek Salvation in the arms of the Charter. Please, read this leaflet,’ he replied. ‘You sound troubled – we can remove your burdens. Please, come and join us this evening,’ Charlie added. With that the woman turned and left – Charlie’s empty stare watching as she gradually disappeared from view. Any fleeting, fugitive chill of uncomfortable, personal memory once more safely returned to the depths of the Charter’s forgiving, collective conscious. ‘Come on people. We have a meeting to get ready for. This town needs our help. Let’s get to it!’ he snapped, as flakes of snow began to fall gently on the now deserted street. 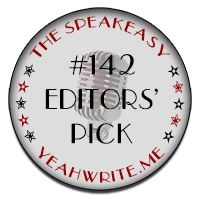 This entry was posted in Fantasy World, Other Challenges, Story Time and tagged 750 Words, Challenge, Creative, Fantasy World, Fiction, Flash Fiction, Novels, Short Stories, speakeasy, WordPress on January 14, 2014 by paulmclem. The first time I saw them words I think I cried. I can’t do that, I can’t, I sighed. Till my brain was all but fried. Flat pack just aint for me. These 38 words form my entry into the Trifextra 100 challenge. The Trifecta editors asked us to add 33 of our own to their starting five. I hope you enjoy what I came up with. This entry was posted in Fantasy World, Story Time, Trifextra and tagged 33 Words, Challenge, Creative, Fantasy World, Fiction, Flash Fiction, Novels, Short Stories, Trifecta, Trifextra, WordPress on January 13, 2014 by paulmclem. We spent most of our summers down at the Point. Warm evenings drinking even warmer beer. Damp, misty mornings filled with laughter, and occasionally regret. The slow walk home a time to discuss grand plans for the future. Our parents no longer needed or expected excuses: they knew we were growing up; they knew we wanted to be together. Today I watch alone as a flaming red sun sets over the Point. The crashing waves, the passing years – they may weather and decay our buildings, age our skin, take our loved ones; however, they’ll never have our deepest memories – those remain with us until one day we are together again. This entry was posted in Fantasy World, Friday Fictioneers, Story Time and tagged 100 Words, Challenge, Creative, Fantasy World, Fiction, Flash Fiction, Friday Fictioneers, Novels, Short Stories, WordPress on January 8, 2014 by paulmclem. As the sun slowly edged its way over the horizon, the working day began for those aboard the boats that bobbed gently within the protective embrace of Achnashean harbour. Up high, noisy seagulls circled, greedily anticipating the ripe remains of yesterday’s catch. From within the limpid, gulf stream warmed waters a seal’s head appeared – silver whiskers glistening in the early morning light, bold grey eyes investigating before returning beneath the lapping waves. On board the Jeannie May young deckhand Alan McBride prepared the creel nets. As he hurried to finish, he noticed a van drawing up to the harbour master’s office. He knew the van, as well as the driver who now strode purposefully towards the boat. Alan had always supposed, and assumed, his father had wanted more than a fisherman’s life for his only son. However, Alan was happy. He had a job he loved, and more importantly a person in his life whom he loved even more. ‘Alan, have you got a minute, son?’ shouted his father, squinting down from the quayside. ‘What is dad? We’re about to sail,’ he replied. Alan hadn’t been a great one for family events in recent times. His mother though was always an exception to the excuses. A quick smile up to the weathered, handsome face in the wheel house signalled reassurance, as well as love. Steaming from the harbour, the lone seal resurfaced, watching them on their way, while above the still screeching gulls now trailed in their foaming wake. This entry was posted in Fantasy World, Story Time, Trifecta and tagged 333 Words, Challenge, Creative, Fantasy World, Fiction, Flash Fiction, Novels, Short Stories, Trifecta, Trifextra, WordPress on January 6, 2014 by paulmclem. On board, champagne glasses continued to clink. Ahead lay a three month world cruise: the ‘Holiday of a Lifetime’ the brochures proudly declared. Excited passengers now swarmed like fevered ants throughout the decks, seeking out ‘cabin’s with balconies’ while discussing times for dining at the Captain’s Grill. A world within a world setting sail from increasingly distant and forgotten shores. On the Quayside the cleanup crew were already on site. Colourful gangs of discarded confetti roamed amongst the empty luggage trolleys. ‘Goodbye’ and ‘Good Luck’ flags lay in puddles as the wavers headed for home. An eerie silence descended over the now almost deserted berth. In the water Mr Stevens puffed and panted. The retired college lecturer from the small Suffolk village of Wotheringham-on-the-Wold had sold his prized Bugatti to fund this trip. A trip to see the wonders of the world; a trip to find a Mrs Stevens before it was too late. He had only missed departure by 15 minutes, the ship was only two miles out – he was a good swimmer; he’d make it. Ignoring the whirring blades of the rescue helicopter, and the cries of the lifeboat volunteers, he ploughed on. Nothing was going to take this holiday away from him. This entry was posted in Fantasy World, Other Challenges, Story Time and tagged 200 Words, Alastair, Challenge, Creative, Fantasy World, Fiction, Flash Fiction, Novels, Short Stories, WordPress on January 5, 2014 by paulmclem. The luminous blue digits of his bedside clock flashed 6:40am. An alarm began to pulse: faintly at first before these early, gentle invitations to rise were replaced by more insistent, inconsiderate buzzes that echoed noisily around the room. From deep within the folds of the duvet Professor Ward groaned as he began to uncoil his barely awake body from that of the still sleeping Mrs Ward. A brisk walk across the cold, bare boards of his bedroom floor soon had the Professor approaching the window. Rubbing sleep from his eyes he pulled wide the curtains, bracing for the first assault of morning sunlight; expecting the warm dawn glow of what was forecast to be another scorcher of a summer’s day. Instead there was nothing but darkness. The phone on the dressing table was already rocking and chiming with messages. Switching on the television he dressed quickly amid confusing reports of blackouts all over the globe. Leaving the house he was shocked by the sharp, bitter coldness biting at his fingers. A thick layer of frost wrapped itself around the cars in his street; ice crystals instantly formed in the warm air that the Professor exhaled from his body. It was July – it felt and looked like the middle of winter. Driving to work he watched as people shuffled along pavements dusted in snow. Everybody wrapped against the unexpected chill. Ahead an accident as a car had skidded into a roadside tree. A bloodied, confused driver just stood staring by his mangled vehicle. Headlights dazzled in the gloom. Streets remained unlit as lamps stayed locked in their summer schedule. The world wasn’t ready for this; there was chaos everywhere he looked. ‘What the hell is going on?’ the Professor asked, as he finally reached his desk at the institute. ‘That’s impossible. Give me a sensible answer!’ he demanded. ‘Here look for yourself!’ replied his suddenly indignant research assistant. Disbelieving, the blood curdled through the Professor’s veins. Image after image of emptiness. Where once sat the flaming, yellow ball which provide light and heat for billions, there was now nothing. ‘It must be there. It must be. Look harder,’ the Professor insisted. A lone, maverick scientist in Zurich was first to make the claim that shocked the shivering world: the sun was still where it had always been – it had simply gone out. It’s light and heat extinguished; the seasons it provided now threatening to merge into one long, dark, cold void. ‘We need to tell people. They need to know what’s going on,’ said the Professor. ‘I don’t think that’s a good idea,’ his colleagues replied, in suspicious unison. ‘The situation will be managed,’ injected a previously unheard voice. Looking up a man in a shiny, grey suit stood in the Professor’s doorway. ‘What do you mean managed?’ barked the Professor. Reaching for the phone he began to dial. As he did so the receiver was grabbed violently from his hand. Before he could continue his protests two other men in grey suits appeared. Theirs didn’t shine as much. Their faces more sinister. ‘Take him,’ they were ordered. An alarm suddenly buzzed. Blaring, deafening – nobody else seemed to hear it. His arms were being held: he was helpless to cover his aching ears. The sound was excruciating. He began to lapse in and out of consciousness. Everyone else in the room was now laughing. Pointing. Staring. Ridiculing. He thinks the sun has gone out! The Professor has lost it! Hysterical laughter grew louder. Sardonic smiles became even more cruel, more mocking. His pleading voice deserted him: agonisingly powerless to reply. The alarm pulsed gently. The clock face flashing 6:40am. Today was the day of the conference. He only hoped his fellow scientists were ready to be told that more dark spots had been found in the surface of the sun. Thinking about telling the world this news had given him endless weeks of worry and stress. However, he knew people needed to be told. The world had to be ready for the worst. To be ready to act before it is too late – before the nightmare becomes a reality. These words form my first ever entry into the speakeasy writing challenge. I hope you like them! Much to my delight, as well as polling third in the voting, this story was chosen as the ‘Editor’s Pick‘. Thanks to everyone who either read, voted for, commented on or simply liked my story. This entry was posted in Fantasy World, Other Challenges, Story Time and tagged 750 Words, Challenge, Creative, Fantasy World, Fiction, Flash Fiction, Novels, Short Stories, speakeasy, WordPress on January 1, 2014 by paulmclem. There weren’t many trees in Shaleford but damn sure if Jake’s dog, Muttonchops, didn’t seem to get stuck up most of ’em. Each time the town’s fire crew was dispatched; each time a ticking off about wasting their precious time was delivered. The calls didn’t stop though – after a while only the chief himself turned up. Now, Jake’s mum and dad had argued a lot when he was younger. These days it’s just him and his mum; she doesn’t even like him seeing his dad. Jake though has a way of getting his dad to come to him. Heck, when you’re the son of the fire chief it has to have its benefits. These words form my entry into this week’s Friday Fictioneers photo prompt challenge. Happy New Year to all my fellow Fictioneers! This entry was posted in Fantasy World, Friday Fictioneers, Story Time and tagged 100 Words, Challenge, Creative, Fantasy World, Fiction, Flash Fiction, Friday Fictioneers, Novels, Short Stories, WordPress on January 1, 2014 by paulmclem.